As the Miami Heat get ready for the NBA Draft Lottery on Tuesday night, shooting guard Dion Waiters has made it clear that there’s no room for one of the top draft prospects. The Heat have a 98.2 percent chance of landing the No. 14 pick in the 2017 NBA Draft, but that hasn’t stopped the shooting guard from voicing his opinion. 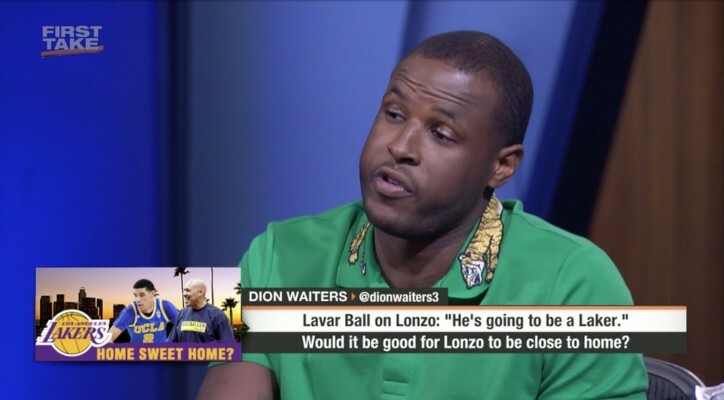 In a guest appearance on ESPN’s “First Take,” Waiters said that there’s no room for a player like UCLA guard Lonzo Ball. The panel asked Waiters where some of his favorite landing spots were for the incoming rookie, or if he thought Miami would be a good fit. “I respect everything he’s doing,” said Waiters. Ian is a multifaceted writer with a special interest in Miami basketball. Having caught the basketball bug as a young boy at a Heat game in 1997, he’s kept his finger on the pulse of the NBA ever since. Having been a season ticket holder ever since, he goes to all the home games and relishes in every opportunity to meet any players, participate in any events, or even just to cheer his team on and learn more about the game.